A simple 5-ingredient chicken dish that's sure to impress. Heat large nonstick skillet sprayed with cooking spray on medium-high heat. Add chicken; cover skillet with lid. Cook 5 to 7 min. on each side or until chicken is cooked through (170ºF). Remove chicken from skillet; keep warm. Add tomatoes, olives and lemon peel to skillet. Cook 4 min. or until heated through, stirring frequently. Return chicken to skillet. Cook and stir 1 min. or until chicken is coated and heated through. Sprinkle with cheese. 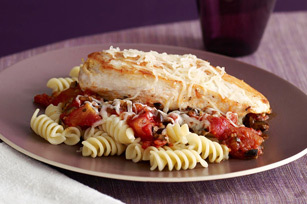 Serve with hot cooked penne or rotini pasta. For garlic lovers, add 1 clove garlic, chopped with tomatoes. The cheese in this flavourful dish provides a good source of calcium.